Korean photographer Jean Chung set out to reveal the traditional heart beating beneath the surface of this very modern city. Her first stop was Namdaemun, a teeming network of narrow lanes crowded with shops. The food vendors along this alley sell everything from Bi Bim Bop (a classic rice and vegetable dish) to rice cakes with chili paste (the yellow and red items in the rectangular steel tray, above). Jean has set her shuttle to 1/30th of a second, to capture the bustle of the market. 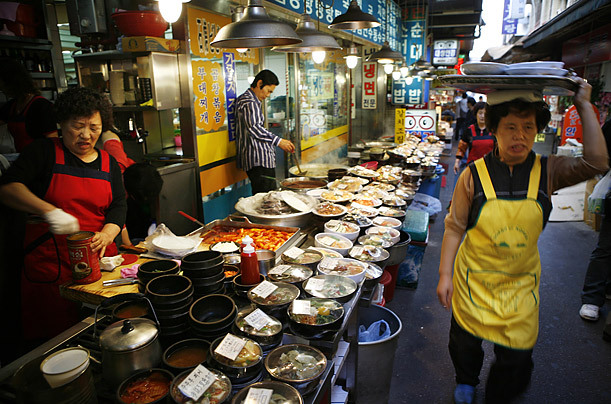 Seoul Guide: Find travel deals, hotels and more!